I was bored and created a spreadsheet to track results and profits (or losses) on modo. You can download it here. You can also look at my oldish article on the EV of various events on Starcity. The document is pretty simple to use, all it requires is that you input each event you play in, the date of the event, and your record in that event. The following screen capture shows the information required. Event: The event type (allowable values are 2M (for a constructed 2-man), 8M (for a constructed 8M), DE (for a constructed DE), sDE (for a sealed DE), Swiss (for a swiss draft), 4322 (for a 4-3-2-2 draft), and 84 (for an 8-4 draft). Please note that the limited event tracking does not account for the value of cards opened, but feel free to add that to your profit if you'd like. Format: The format of the event (for constructed: T2, Block, Momir, Pauper; for limited: M12 and ISD). Wins: The number of wins you got in the event. Losses: Number of losses you got in the event. 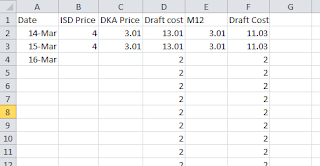 Since the Spreadsheet takes care of pricing, the only other thing you have to update is in a second included sheet which can be accessed by clicking on the tab on the bottom of Excel. 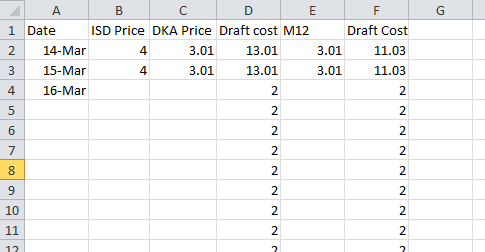 All you have to do is put in the date (under Date) and the buying price for ISD, DKA, and M12. If you do not put in the price for a date the tracking functionality will not track profits correctly.